The apartment is FULL to the brim.... completely oozing with Halloween goodness! But yet I keep going. I tell myself I will have more fun decor when we move into a house! This project was definitely inspired by Little Man. Shocker. He inspires a lot of projects! 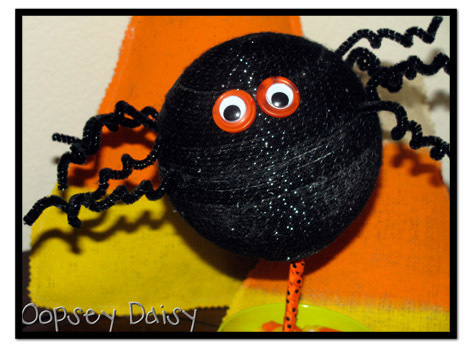 Ever since I made the eensy weensy spider, Little Man has recognized and loved spiders. Normally, I probably wouldn't encourage this, but it's Halloween!! So I created this little spider topiary. 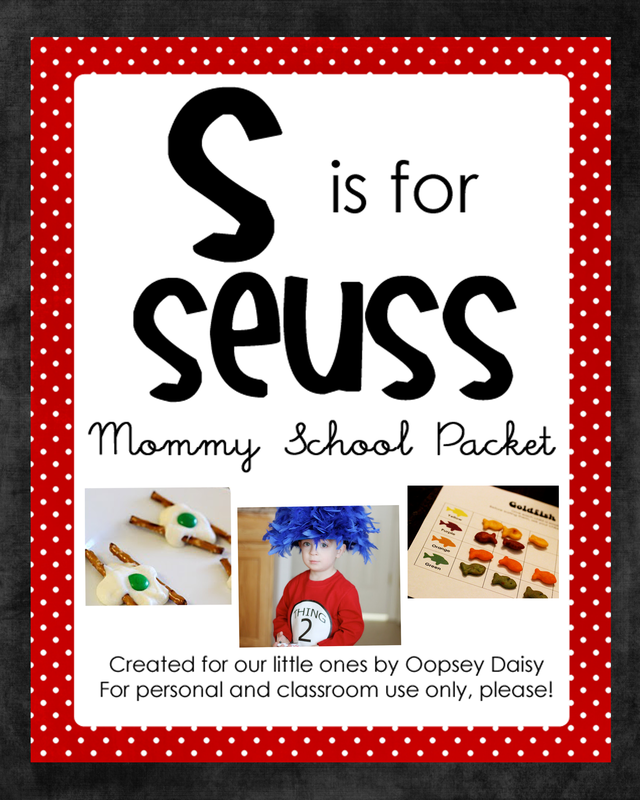 This is a quick and easy project, and it's a kid-pleaser for sure! Isn't he cute?! Come along with me, and I'll show you how to make one! 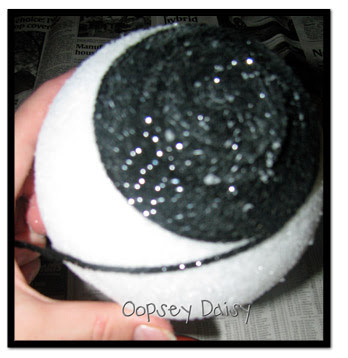 I started out with black sparkly yarn, a styrofoam ball, and spray adhesive to make the spider's body. 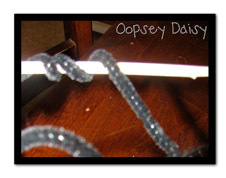 You could use your hot glue gun instead of spray adhesive, too. 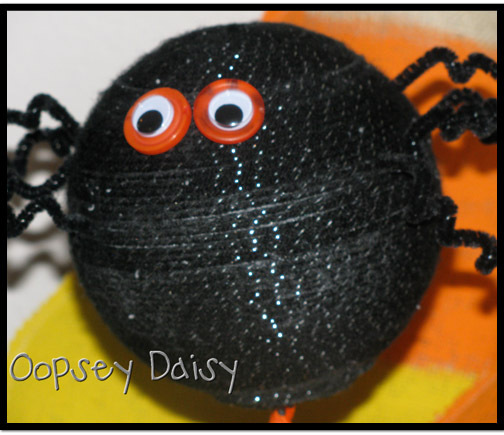 I think the black sparkly yarn really gives the spider some "sparkling" personality! Just start wrapping the yarn around and around the ball. I used spray adhesive, but I did start by hot gluing my center to give it a sturdy anchor before wrapping. The key to wrapping is tightness! Be sure not to leave any gaps between layers of yarn! Once you're all done covering the styrofoam ball with yarn, it's time to give that spider some legs! I used 8 sparkling black chenille pipe cleaners. They stick easily into the styrofoam ball. I decided to make their legs curly, so I just wrapped them around a wooden dowel to give them some shape. I found this fun bucket in the dollar section at Target. I secured a half wooden dowel into just a tiny square of styrofoam inside the bucket. 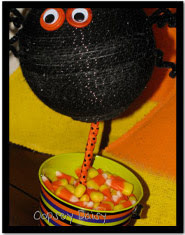 I covered up the styrofoam with candy corn... what a fun fall treat! I can't get enough! I wrapped the half dowel with bright Halloween ribbon, using mod podge to secure the whole thing. I just stabbed the dowel right into the spider's body. I couldn't decide between button eyes and google eyes, so I used both! I used a bit of hot glue to secure them to the spider. Normally, I'm not a spider fan, but this little guy just makes me smile! His curly legs are out.of.control, and I like it!! Little Man keeps pointing at it and giggling, too, so I think it's a success! He also keeps digging out the candy corn in the bucket and bringing them to me... hopefully we'll still have some left inside!!! I don't know if there is much my son would love more than a giant spider. Too cute! That is so stinkin cute!!! Hope to make one! Alison, I am glad you used the buttons and the googlies! Too cute! Adorable! 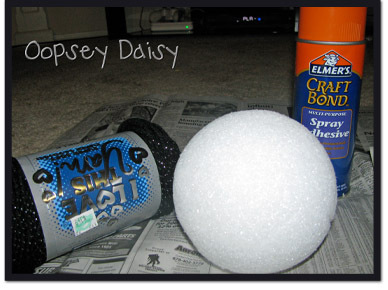 I love the sparkly yarn wrapped around the styrofoam ball. He's definitely a cutie! That is seriously so cute. It would make me happyy too. My boys would love it too. I just wanted to say thanks for blogging. 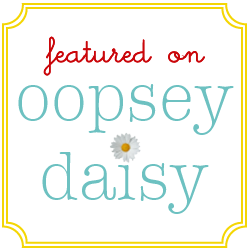 I love seeing what your up to and I LOVE the quiet books you've made for your son. Thanks for inspiring me! 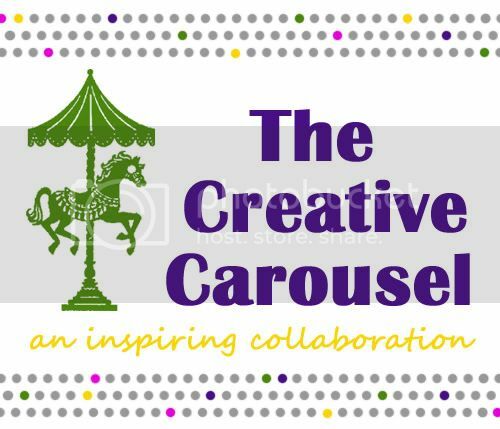 If you'd like come check out my blog sometime. I can't stop either! 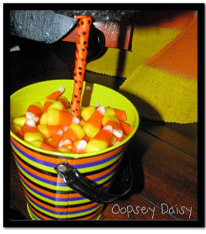 I am still doing crafts with kids (did paperback book pumpkins with my daughter today on my blog) or buying fall decor. I've got to stop…Adorable post. wow, that looks so cute! Love the googly eyes. That is so cute! And I don't even like spiders! Ha! Very cute! how long did it take to wrap that ball with the yarn! If only I wasn't so scared of spiders! 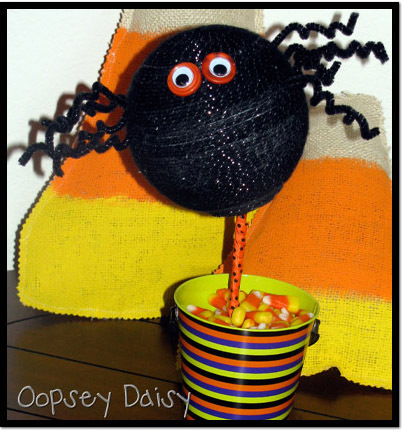 I don't have any spiders, or spider crafts in my house. My poor kids! 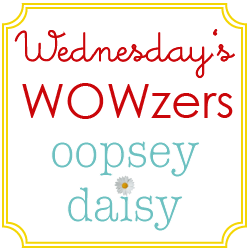 oh, and Thanks for linking up to Topsy Turvy Tuesday's! Hey cute girlie I feature this on Hoo's got talent today! Thanks for linking up to the party!